© 2016 SYDA Foundation®. All rights reserved. 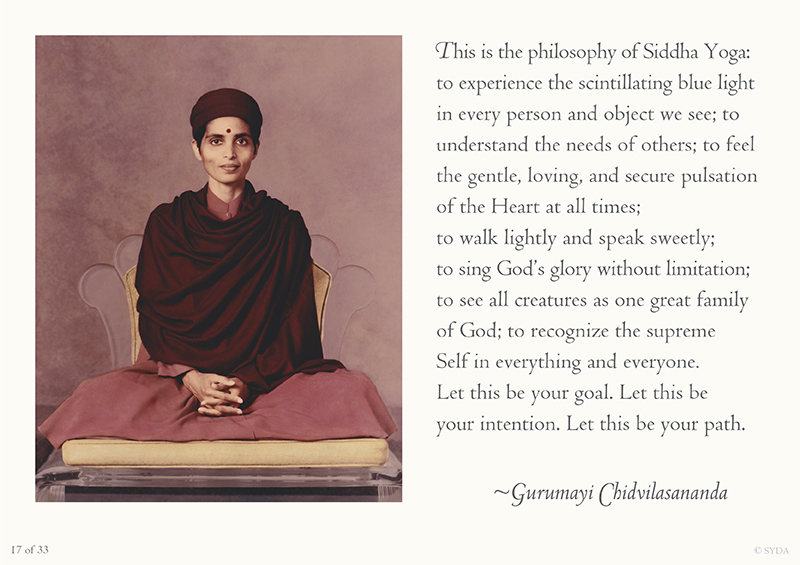 These images and words are for viewing on the Siddha Yoga path website only. Do share the web address, www.siddhayoga.org with family and friends. Today, I woke up having a special dream. I dreamed that I was entering a hall full of people in deep meditation. I slowly walked to the front of the hall and to Gurumayi, who was also in meditation. The dream inspired me to visit the Siddha Yoga path website, where I found this title, "Darshan and Wisdom." I felt so close to Gurumayi. After seeing the touching photograph and reading Gurumayi's teaching, I was inspired to look back over the 32 years of my sadhana. Over the years, the love, care, grace, and understanding I have received from Gurumayi's teachings and the practices have taken me deeper and deeper inside myself. I have been able to connect more and more with my heart, which has also led to a stronger inner connection with Gurumayi. Now, I just have to turn inside to have her darshan. 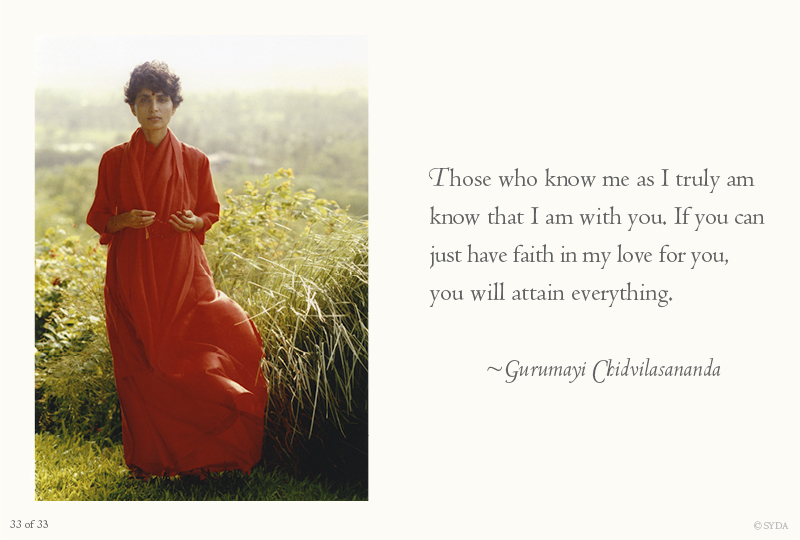 I know that Gurumayi is always with me, in my heart. Every day, when I bow to the padukas on my puja, I ask Gurumayi to come with me to my work and guide me to do my work in the same selfless way that I would offer seva. Thank you, Gurumayi, from the bottom of my heart for giving me these understandings and for always being with me in my heart. Gurumayi's compassionate words answered both a heartfelt prayer and a question of mine with such clarity and simplicity. I felt her blessing reach right from her words, through her picture, and straight to my heart. 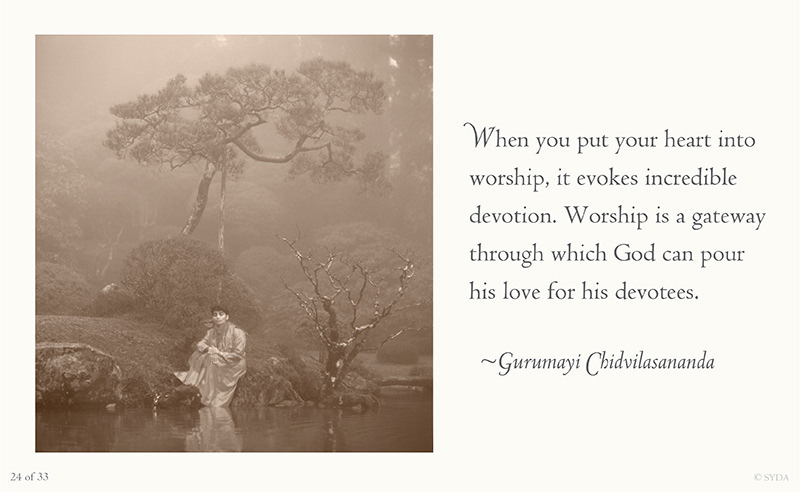 I am reminded again of the precious and mysterious connection that exists between the Guru and disciple, and feel an overwhelming appreciation for the amazing good fortune to have Gurumayi as my living Master. I am filled with awe and infinite gratitude. When I gaze on Shri Guru's divine form, I find in myself the power of discrimination that I need for the current situation. This has been my experience many times. When I began to read Gurumayi's words I felt my body scintillating with golden energy. I read each line very slowly. I wanted to become full of this golden light. I read and reread her words, feeling the shift in my state of mind and the release in my body. I became quiet and peaceful. This image made me think of the silent prayer I offered many years ago at Lake Nityananda. This darshan reminded me of my prayer: "Please, let me always remember you, God." When I opened this divine invitation to experience darshan, I was instantly struck with the deep rasa of gratitude. I had the experience of not only seeing the image of Shri Gurumayi, but being seen by her. I felt the longing in my depths to be seen, and the experience of having that longing be fulfilled merged into a flowing rainfall of gratitude. Then I read the words of the teaching—and experienced a longing to see the face of God in others, as I long for the face of God to be seen in me. I experienced darshan, which opened the flowers of my heart. I felt Shri Guru's grace within me, through her loving glance. May others perceive the face of love in me, and may I see the face of God in every human face and in every particular thing. 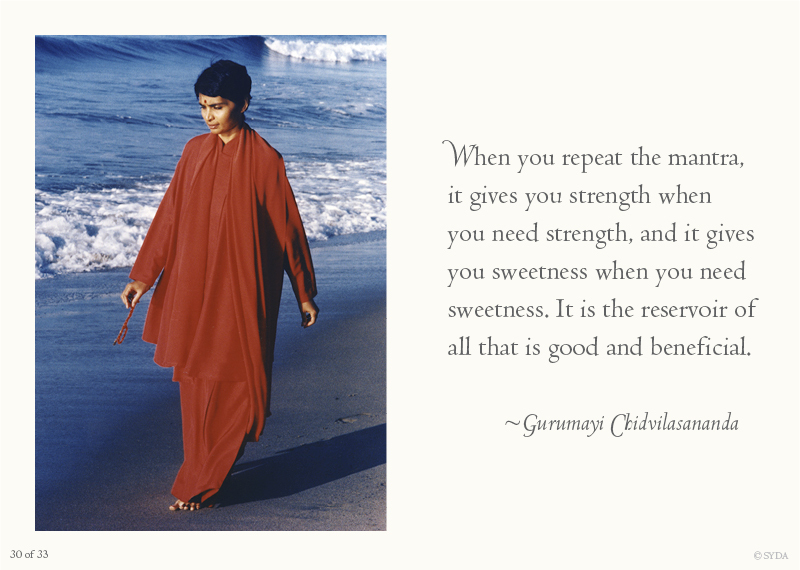 These sacred words make me feel so connected to the shakti, to my Self, to the Truth, and to Gurumayi. And they reassure me that I must be a true seeker! I'm very grateful to Gurumayi for giving us so many ways to make these beneficial connections. No rain has fallen here for months, and just as I was opening the Siddha Yoga path website and praying for blessings, I heard the pattering of a few precious raindrops. For me it was a delightful confirmation of my Guru’s presence. And, this photo of Gurumayi with the umbrella popped up at that exact moment! With even the most subtle experience of darshan, my heart experiences the sweet satsang of Gurumayi’s presence, and tears wet my face. 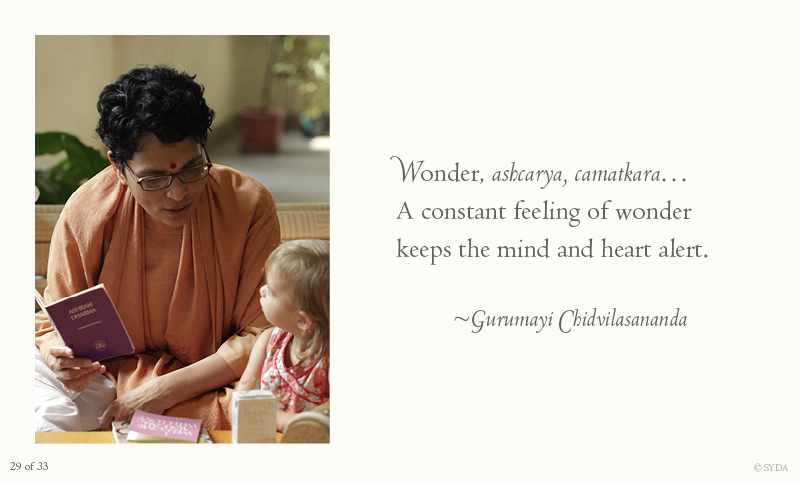 I know my Guru has not forgotten me, and I am so grateful for her being and love. Now, as I finish this writing, a downpour begins, showering blessings upon us all! Thank you, most compassionate Gurumayi, for being here with us, and sharing your delightful play! I smiled when I saw this photo of Gurumayi holding an umbrella. I can already picture myself holding an umbrella and remembering this photo and teaching. While having Gurumayi’s darshan with this photo, I immediately experienced Gurumayi recognizing my greatness in such a way that I simultaneously experienced it. I experienced the greatness of the Self in her and in myself. 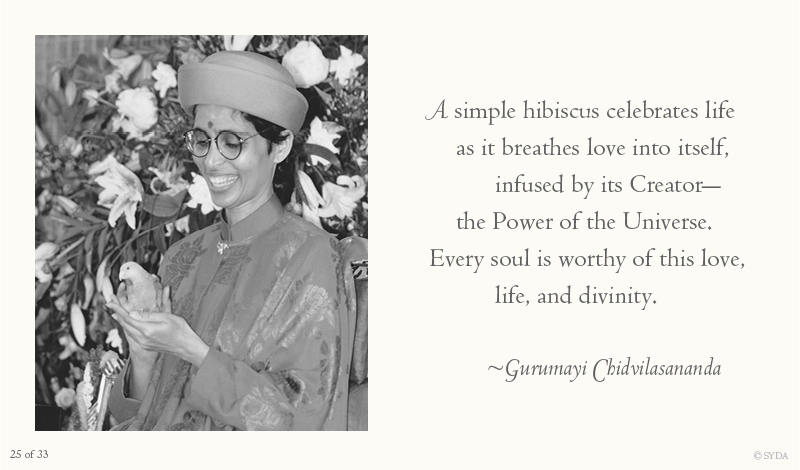 I feel it is Gurumayi’s grace, love, and compassion that make that vision of greatness possible. May I in turn see that greatness in all others and in creation. I am immensely grateful and awed. Thank you, Gurumayi. As I read Gurumayi’s words, I experienced that what she was describing was happening to me. Her words were totally alive and transformative—not ordinary words at all, but imbued with the power of her divinity, entering my whole body. 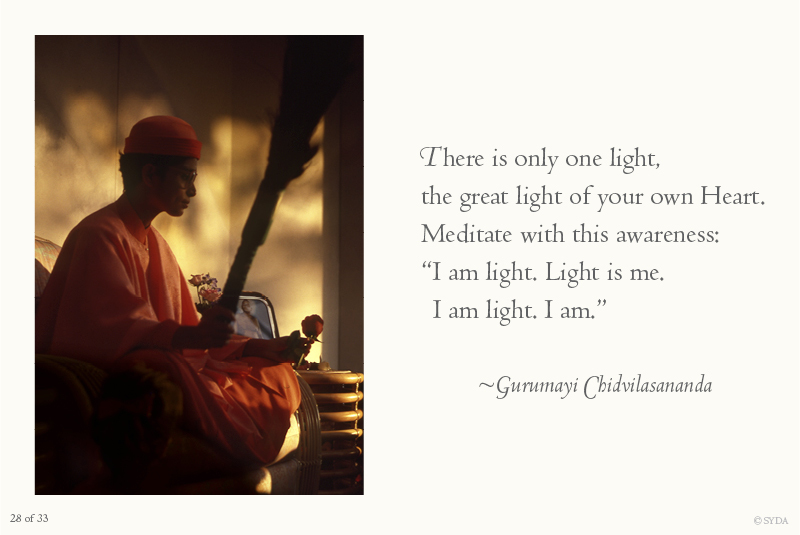 Thank you, Gurumayi, for sharing your light with me and everyone. When I feel that Gurumayi is with me, I feel joyful. And when I feel my heart open, I think I am really in a pool of joy! Gurumayi’s words remind me of my experience just last evening. During the last golden rays of sunlight, I took my dog for a walk around the neighborhood. I listened to a recording of Baba reciting Shri Guru Gita as we walked—farther than I had intended—looking at the trees and the end of the day's sky. When we returned home, I sat down in a state of complete contentment and listened to the rest of Shri Guru Gita. 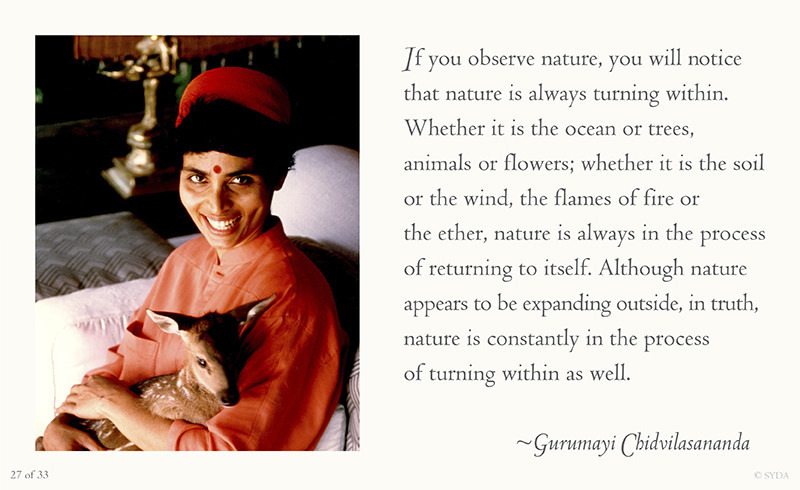 Whenever I read this quote from Gurumayi, I immediately become aware of my breath. As I breathe in I perceive light, freshness, beauty, joy, and enthusiasm. I can smell the trees, feel the wind, hear the leaves moving, and enjoy the warmth of the sun. As I breathe out, I feel release, easefulness, and lightheartedness. I can “hear” silence, see the moonlight, and enjoy the state of peace. Last evening I took a short walk, chanting while I walked. As I moved along the paved road lined with trees, I came to an opening in the branches at an intersection of the road in which the crescent moon was beautifully surrounded by small, dark clouds and stars. At that moment I was awestruck, and I could feel my heart open as wide as the expansive sky. I stood there for a minute, feeling bathed in an inner intoxication, and then a bright light of a distant oncoming truck overtook my field of vision. As the truck turned away, I moved back into my former position. The sky had changed, but the feeling in my heart was still one of expansion and joy. 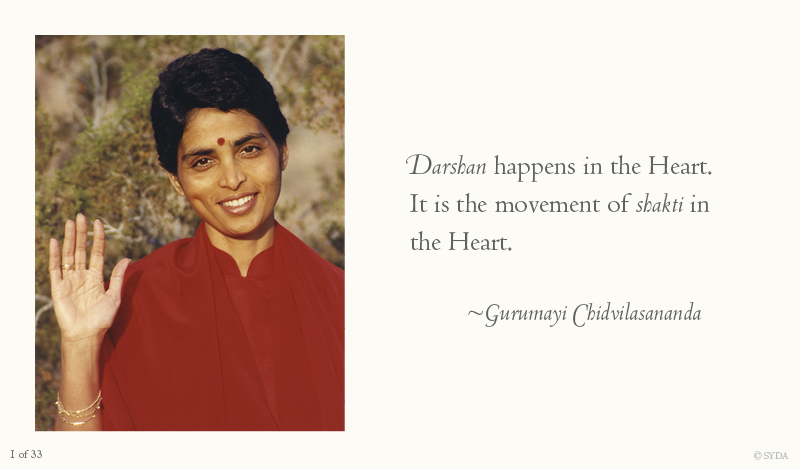 Then, this morning, as I read Gurumayi's Darshan and Wisdom regarding the Heart, I was struck by how my evening's experience resounded with her grace. 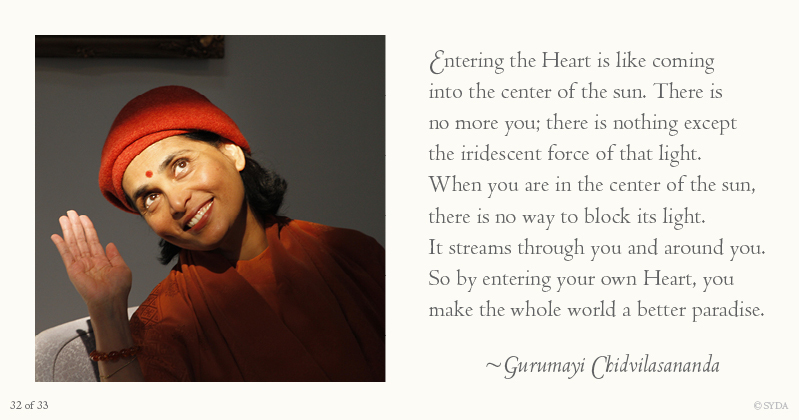 I am so deeply appreciative of Gurumayi’s teaching about the Heart. Whenever I experience a challenge, and my mind begins to worry, I know I have a place to go to inside myself—that heart with a capital H. Then I deal with life from a place of strength and wisdom, things become manageable, solutions arise. This photo of Gurumayi and the ektar is the one that called me, the first one I clicked on. It reminded me of a Siddha Yoga satsang with Gurumayi in Manhattan in 1985, in which we chanted Jay Jay Vitthale and Gurumayi played the ektar. It was the first time I heard that chant, or the ektar, or experienced such ecstasy. Since then, and for many years, one of the sevas I offer has been in the music department as a lead chanter. That initial ecstasy has sprouted into a blossoming forest. 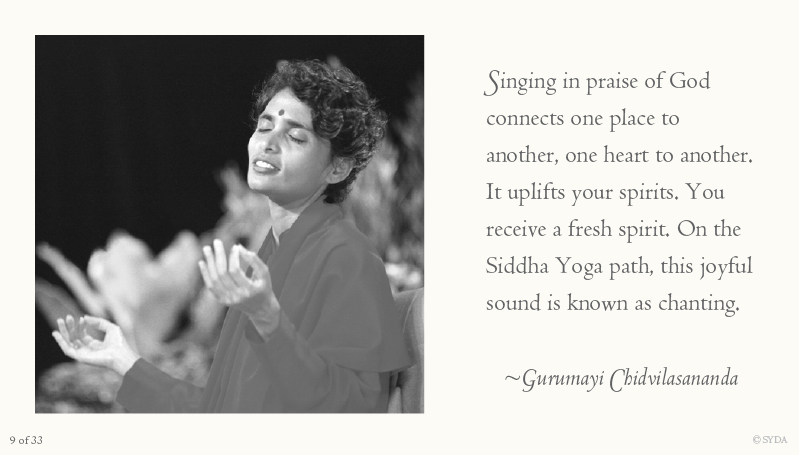 There is nothing like Siddha Yoga chanting! It is my mooring, my teacher, my port of safety and solace—my direct and immediate connection to the divine. Synchronistically, tonight’s chant is Jay Jay Vitthale. Whenever I chant it I connect to that first time, and realize how much quieter my mind and my life have become. And for this I give thousands of thanks to Gurumayi and the Siddha Yoga path. Reading this teaching, I remembered chanting the divine name with Gurumayi. The chanting took me to previously unknown lands of ethereal beauty and serenity where love flowed and connected me to bliss. I shed tears of happiness that seemed to wash away fears and melancholy. A feeling of completeness grew within me. My mother taught me to pray when I was a very young child. That is the greatest gift she could have given me. For me, prayer is the most important thing to do in order to create a good day. 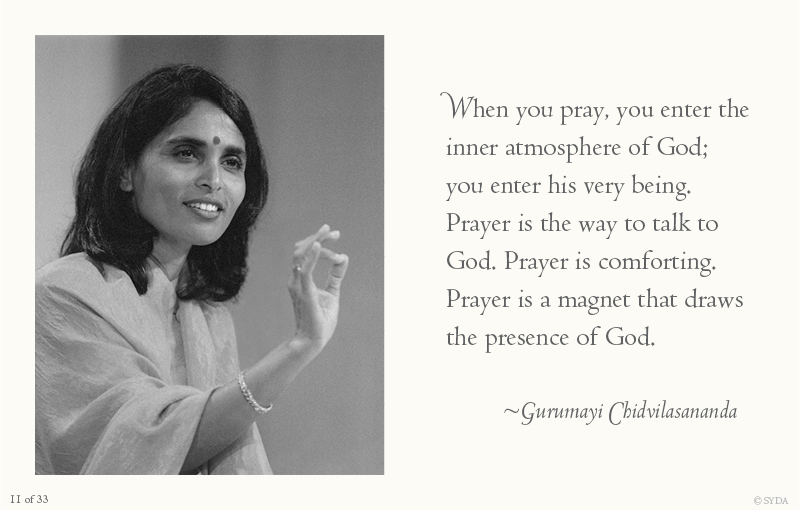 And now, Gurumayi affirms the power of this gift in her teaching, "Prayer is a magnet that draws the presence of God." Thank you, Gurumayi, for this reminder of the importance of praying for my family, friends, the world, and myself. I am so grateful to read these words from Gurumayi. They describe my experience of prayer so well and reassure me that the connection I experience with God when I pray is very real and not something I am imagining! Gurumayi's teaching also encourages me to continue in my practice of prayer, which I can do at any time wherever I may be. Two days ago, I took a walk on the grounds of Gurudev Siddha Peeth and then sat on a bench overlooking the beautiful garden. The moment I closed my eyes, I imagined that Gurumayi was coming towards me, inviting me to walk with her. With enthusiasm, I accompanied her in my mind’s eye. As we walked, I could not stop sharing with her about all the love that she has given me and how happy I am to be in Gurudev Siddha Peeth. I could feel my whole body filled with excitement and, at the same time, I experienced a profound calmness within me. As we paused, suddenly I felt like I was expressing my love to Gurumayi just like a puppy. I opened my eyes in laughter as I thought, "A puppy!? What a wonderful way of expressing unconditional love!" Today, I look at the picture of Gurumayi with the dog, [number 12 in this series], and tears of recognition come to my eyes. 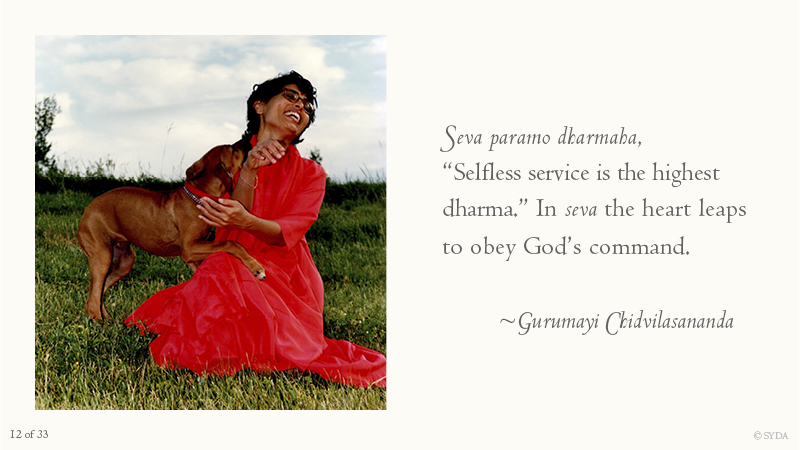 I have always loved seva, this mysterious practice of offering selfless service. I experience it as the most amazing and profound teaching in how we are not separate—because with each offering of seva, it is I who is also being rejuvenated, invigorated, centered, and made happier. 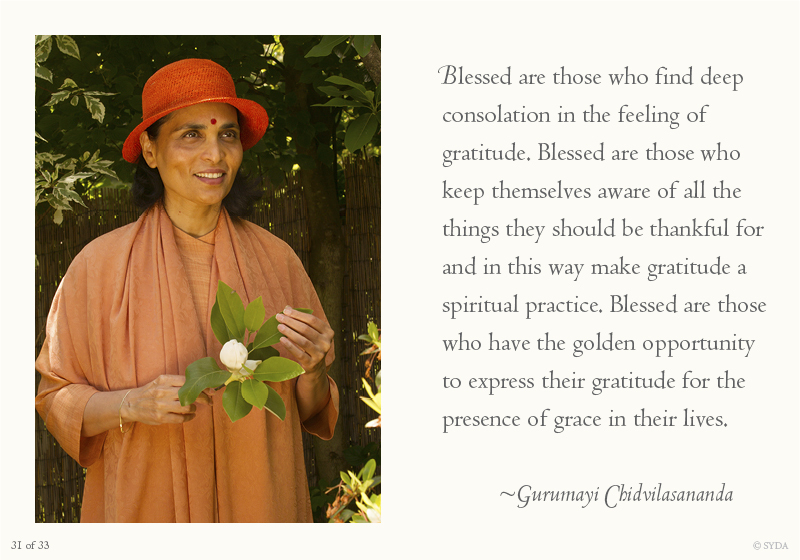 I am so grateful for the steady wisdom and love of Gurumayi. As I received Gurumayi’s darshan through this passage, I felt a sense of peace and patience flow through my mind and heart. I began to experience a deeper feeling of my own self-worth. I began to trust that things were going to be OK. 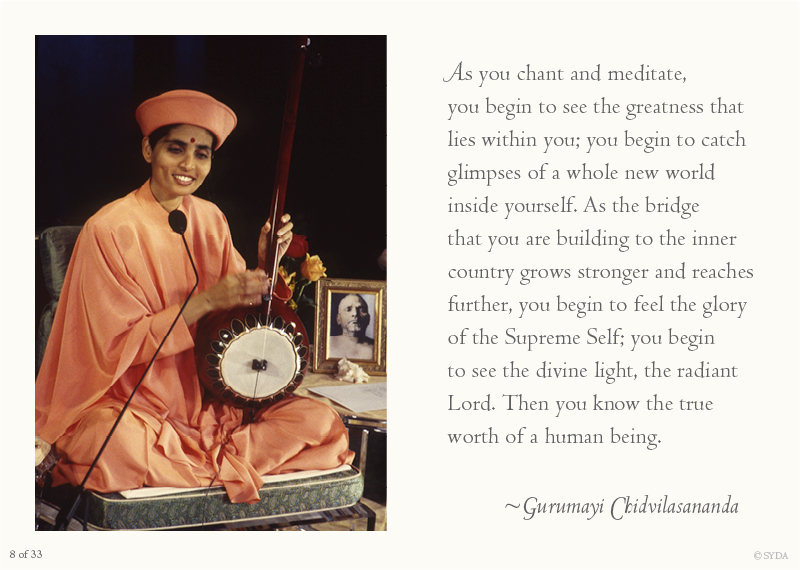 These words remind me that the Guru is always ready to share her grace and love. I have been away from home, working with a group of clients with diverse needs. I was not feeling totally at ease. 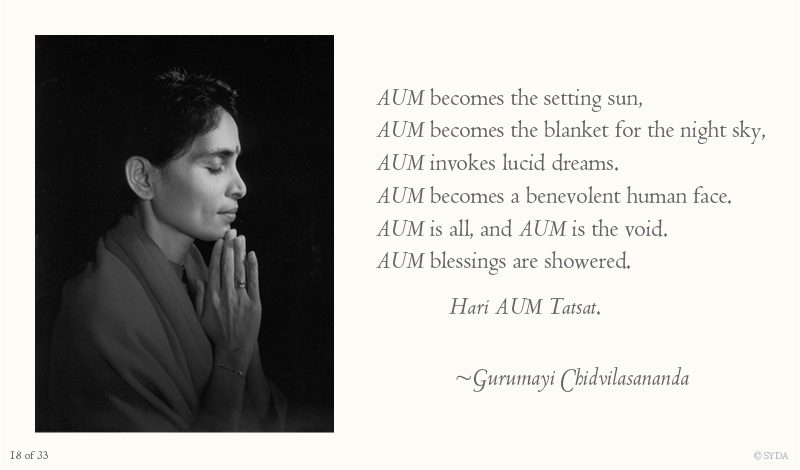 Then, when I read these words of Gurumayi, my fear melted away, I experienced the love inside, and everything flowed in my work with my clients! 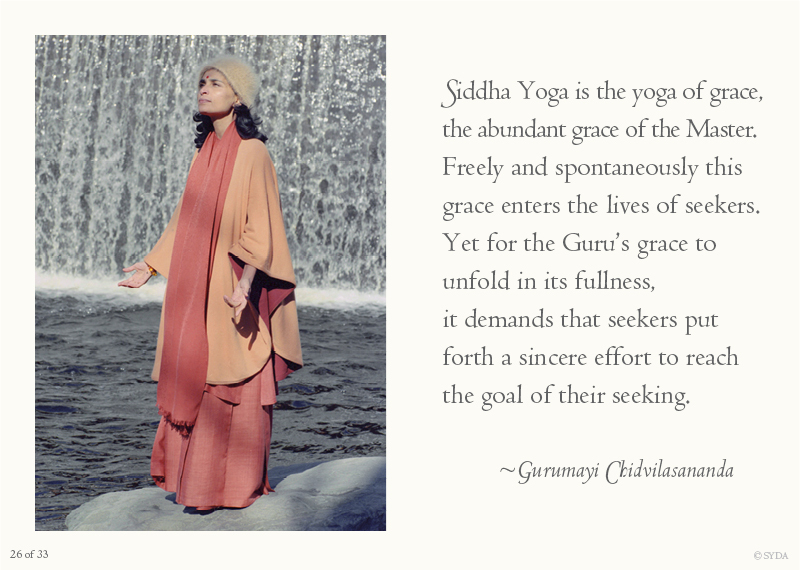 I am so grateful to Gurumayi for making her darshan available through the Siddha Yoga path website 24/7. This darshan brought me to my knees and then into my heart of hearts. I had fallen into seeing differences and feeling separate from my family members. 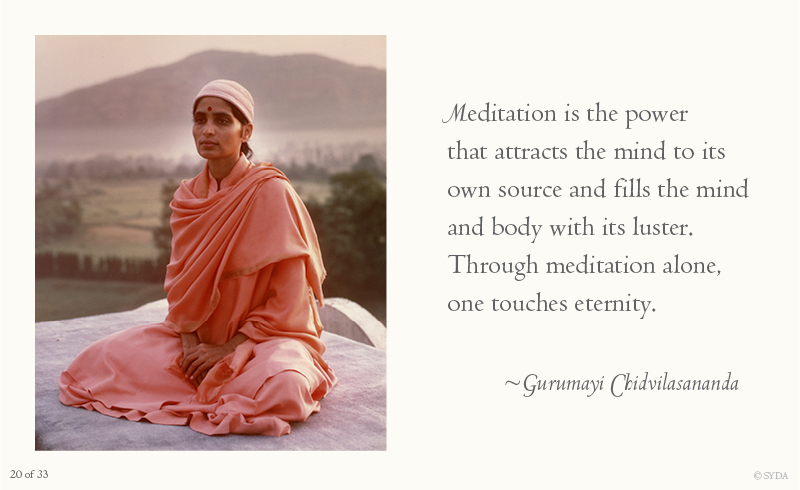 Gurumayi’s words reminded me where I need to focus and rest my mind. Thank you, Shree Guru, for picking me up again, dusting me off, and setting me in the loving direction of the heart! 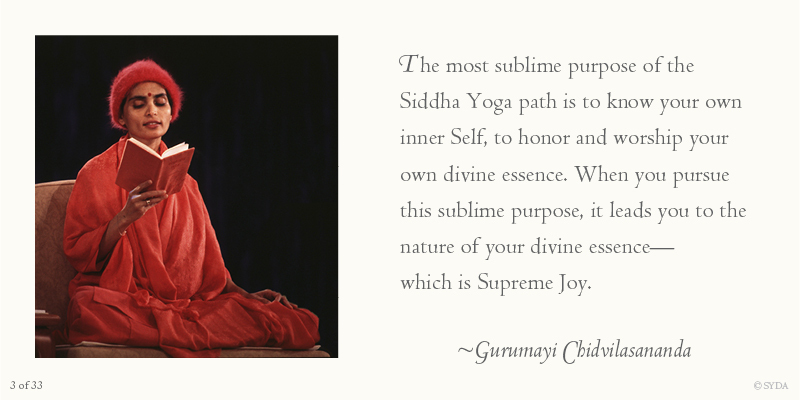 Gurumayi’s words are a great reminder to continue the practice of meditation and to remember that the divinity and splendor of my inner core are right here, inside me, and accessible! 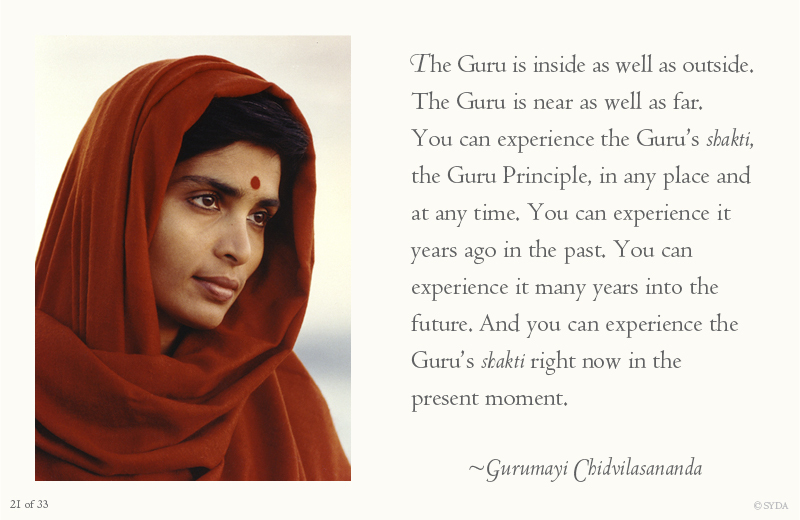 I love the wisdom of Gurumayi’s teaching about the Guru Principle. I feel that this is the main teaching that I will be joyfully learning about and engaging with for the rest of my life. For me, understanding the Guru Principle is something I long for—not only an intellectual understanding, but a deeper understanding, all levels and at all times. 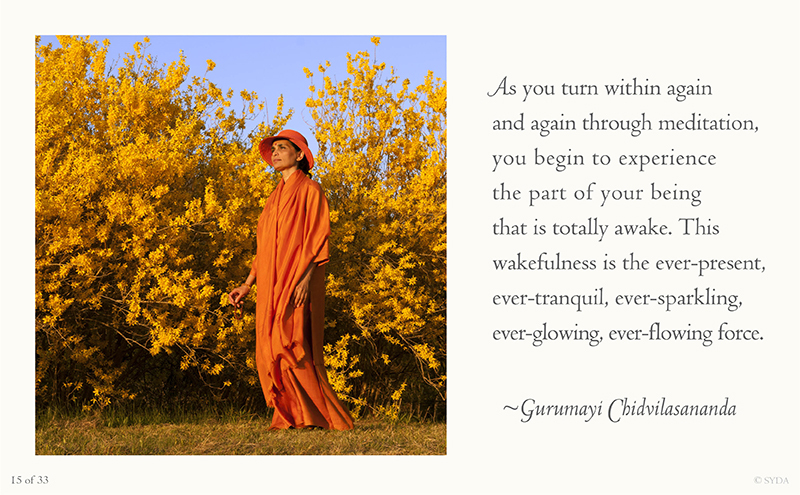 Contemplating these teachings from Gurumayi is an amazing gift, which opens my subtle attention amidst my daily schedule and household routines. It's so splendid to be touched in my heart in this way, feeling the radiance of the Heart shimmer in me. I was taught as a child to be modest and not claim, “I am great.” But Gurumayi’s teaching encourages me to experience my true greatness, “invoking the presence of great virtues within…" As I look at Gurumayi’s picture with the leopard cub, one virtue I can think of is strength of heart, which allows me to understand and overcome the "wilder" aspects of myself—those ego-driven aspects that, when not “tamed,” could be harmful to myself and others. 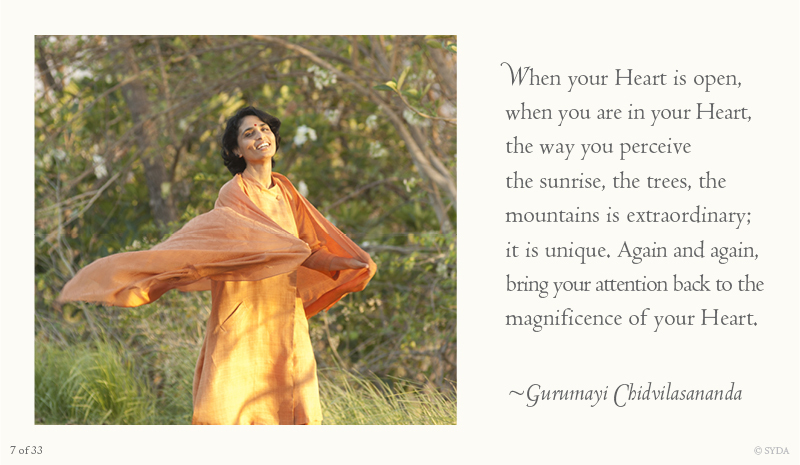 Thank you, Gurumayi, for this healing and transformational guidance. Tears came to my eyes as I read "O Lord, reveal yourself in this person..." It was a reminder to me that God is in everyone, not just in the people I like or find pleasing to be around, but equally in the people whom I find difficult or challenging. May these words be ever in my awareness! 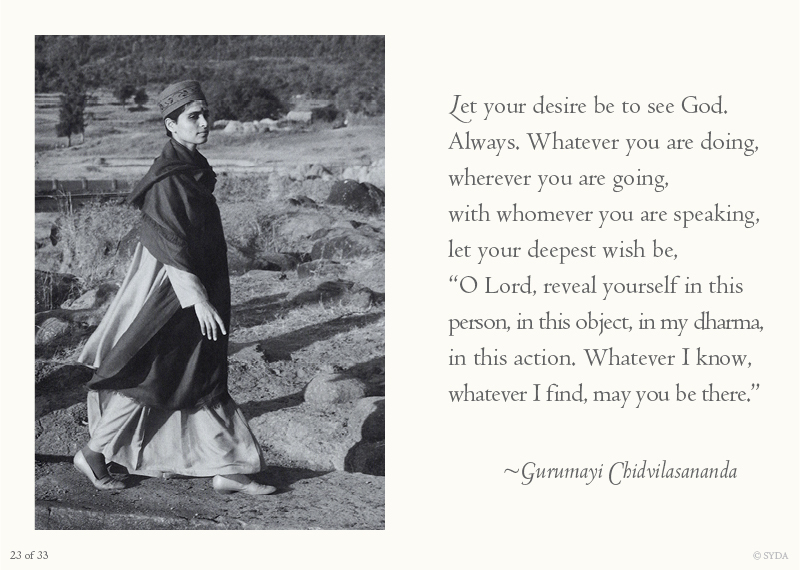 Thank you, Gurumayi, for the teaching in this beautiful prayer. 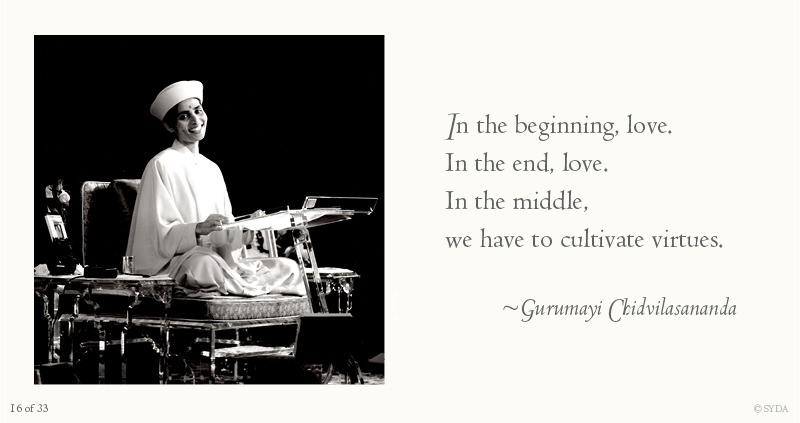 I was deeply inspired by this quote of Gurumayi—and thankful for it! It has reminded me that the practice of counting my blessings is transforming my outlook on life. I no longer look to what I think I need, or need to receive, in any situation. Rather, I practice remembering that in whatever way a situation is unfolding, it is for my own benefit: it may be there to strengthen my character, or to teach me to look deeper into myself, or to practice not judging myself and others and to come from a place of love instead. This practice does not yet always come easily to me. It is, however, always available. And when I do remember to do it, it unfailingly changes my mood and brings me closer to my heart, and closer to God. I have recently come to this spiritual path, and the love I feel is indescribable. I feel I am being given great strength to overcome every obstacle. Although life can be difficult, my approach towards it is different now and everything is much brighter. Thank you so much, Gurumayi. I am grateful that you are with me; I feel your presence. I do know that Gurumayi is with me. I have had faith in her love for me for many, many years. And I am convinced that I will attain the highest, with Gurumayi’s grace, guidance, and blessings. 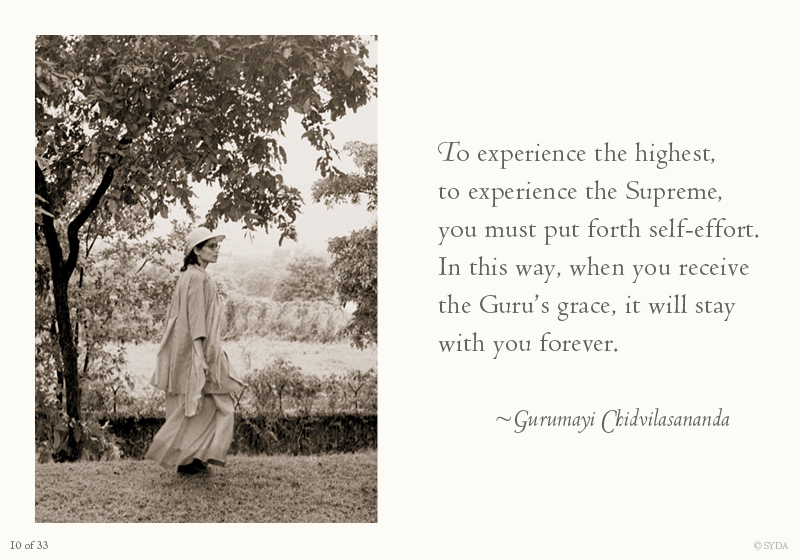 Today my spirit has been uplifted by having Shri Gurumayi's darshan in the form of these pictures and words. Suddenly, I am joyful. Thank you, Gurumayi, a thousand times for your love. I am so filled with gratitude that my heart is overflowing. 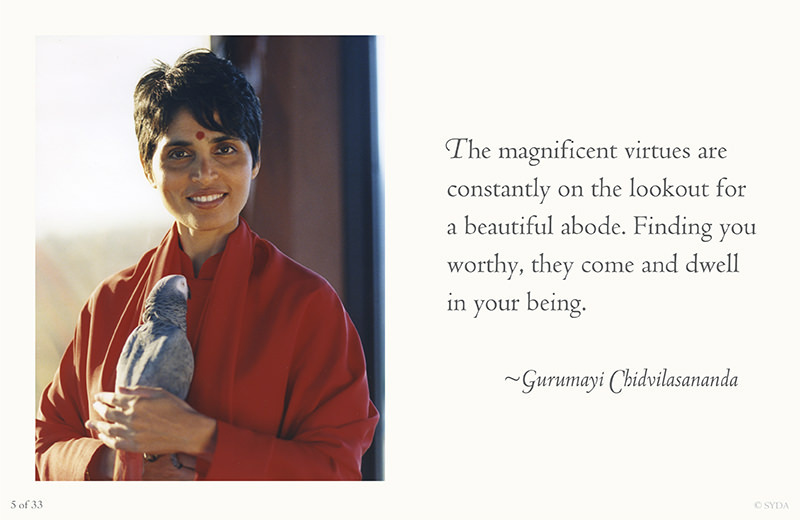 Each time I visit this exquisite page and click on one of the inspiring photos of Gurumayi, I have the very experience that she describes in this quote. I experience the shakti enlivened within my body, which reminds me of Shri Guru who bestowed the gift of shaktipat disksha on me. In those moments, I know that Gurumayi is with me. It is tangible. 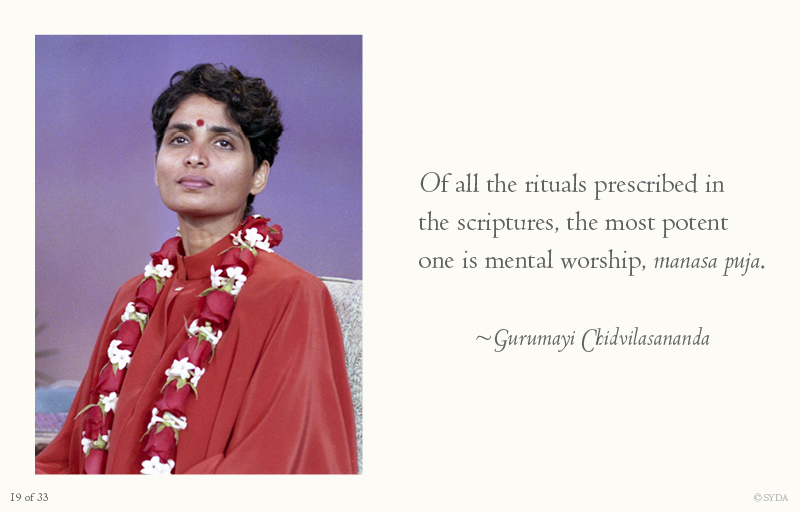 Gurumayi, I am so grateful for your presence in my life.